We carefully source all treats in this box from companies known to deliver Gourmet-quality snacks. This includes the Boujie Baking Company and North Park Nuttery in San Diego. 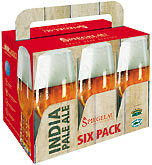 You can't beat the hoppy flavor of IPA, and this gift box is the next best thing to the tap at your favorite brewery. Sent this to my son for his birthday. He RAVED about it. And added that even the "filler" items were terrific. 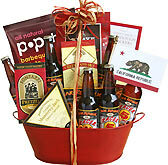 He said most gift baskets have boring filler items. Not Beer Gifts! His family fought over the Spicy Pretzels. I appreciated that I was able to pick which beers to include. I also needed a later shipping date which was accommodated almost to the minute! Highly recommend Beer Gifts! I have ordered from Beer gifts on several occasions now and I couldn't be happier. The products are always well packaged and always delivered on the date I request. In a word, this company is "outstanding" and I highly recommend it to anyone looking for a unique gift idea for those hard to shop for people. The recipients always love their gifts. So far so good. Gift arrived as expected. I will say this, I initially had it going to the wrong address. But sent an email (it was Sunday), and Monday morning they responded right off the bat confirming the correction. That was cool, and goes a long way. I would do business with them again. Would love to see more beer options, esp IPAs. 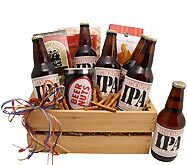 I bought an IPA basket for my husband for Valentines - and he loved it!! He was out of town for work and so I wanted to send him something useful and something he would enjoy. i was also given great customer service - which I appreciated a lot. Great experience. I sent the gift and even needed it to arrive later and they did this for me. The receiver thoroughly enjoyed the basket and selection of IPAs. I would use this company again. Perfect place to order a gift for that special friend. Easy to order and shipped right away. 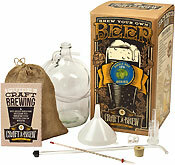 I will be using BEERGIFTS.com next year for sure!! I know nothing about beer. My friend likes IPA and this looked good. She was delighted to receive it and said everything is tasty. I ordered this for my son's birthday. He was very pleased with the beer as well as the snacks. nice presentation and good variety - would definitely buy in the future for gifts as well! Great gift. I love that it was gift wrapped when it arrived. I would order again. Left a good impression on our nephew who likes better beers. Sent to Dad for Father's Day and it was a big hit!